This is an upgrade-only purchase. 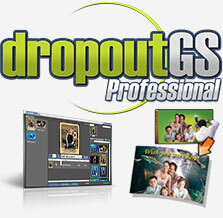 You must have already purchased a license for dropoutGS Express w/Premium Suppport for this upgrade to be valid. Includes one year of Premium Support! Perfect for the event photographer that doesn't require a point-of-sale system, dropoutGS Express allows you to harness most of the power of dropoutGS Professional without the cost. Process regular photos, green screen, and lenticular flip all in one package! Create accurate compositions and prints with your 3D backgrounds and more. Features the rapid "One Click Print" system that allows photographers to shoot, process, and print with the click of a button.